Support Our Rossmoor – Join the RHA Today! Is Rossmoor an Exclusive Name? AlertOC – Stay Informed. Be Safe. Well, Jack Frost was not to be found nipping at anyone’s nose on Saturday night when the RHA held the 2nd annual Rossmoor Christmas Lights Bicycle Tour. The evening weather could not have been more accommodating and attracted over 110 bicyclists to check out Rossmoor homes on the Rossmoor Christmas Lights Hot Spots Map. 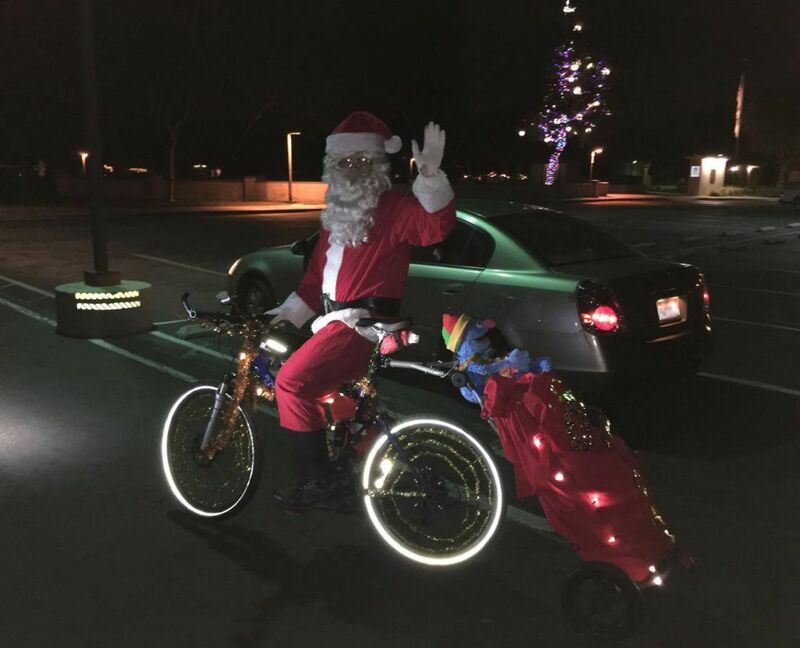 Rossmoor Christmas Lights Bike Tour 2017 – Santa Clause Rides! We had no idea how many people to expect. 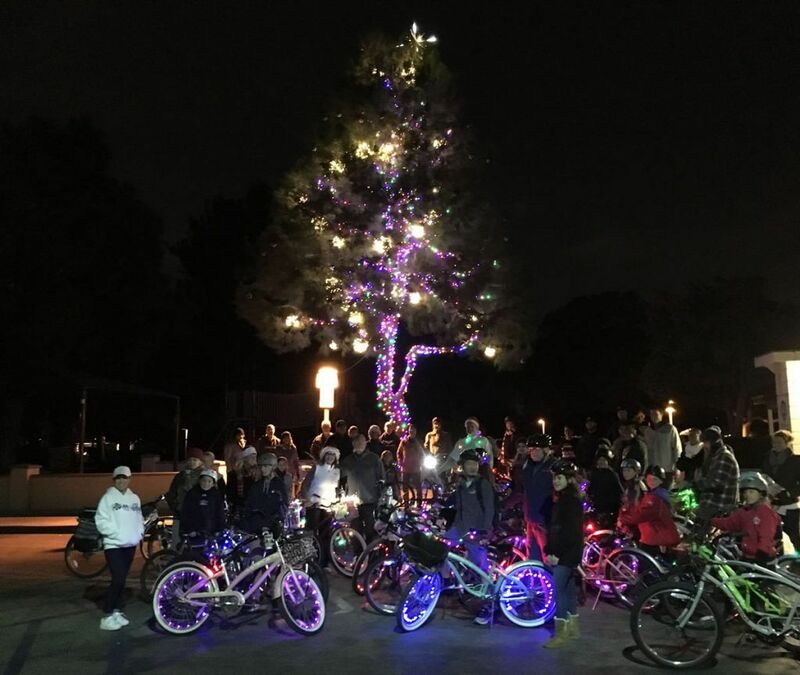 Word of mouth traveled via the RHA website and Nextdoor posts, and we were pleasantly surprised when over 100 people of all ages meet at Rush Park with their bikes all decked out in colored lights and Christmas music playing. One rider even dressed as Santa Claus adding to the fun, and we rode throughout the streets, making for a colorful bike parade of lights. Next year, we’ll reach out to get some volunteers to help guide bikers along the route, making sure everyone can safely ride through the major street intersections. Fortunately, the drivers were understanding as the bike parade passed from one house to the next, many of them wishing us a Merry Christmas. Hopefully, it will lead to even more participants next year for the Christmas Lights Tour! Looking ahead, with so much interest, let’s make this an annual event, with next year’s tour planned for the evening of Saturday, December 22. Mark it on your calendars (we’ll post updates and details here) and enjoy the rest of 2017 with friends and families while the neighborhood Christmas lights are still shining! Is there a Rossmoor bicycle group? Hi Richard – I am checking to see if there is one out there. Our monthly RHA Board meeting is open to the public and Rossmoor residents are encouraged to attend. Get the scoop on all the important info for Rossmoor Residents. From events to information on policies and regulations that impact Rossmoor residents, sign up to get informed.